Horse fencing, stock fencing, rabbit netting, post and rail fencing, electric horse fencing, poultry fencing, Lincolnshire fencing. Specialist or multipurpose application — Fencing and Field Care can offer you a wide variety of options and materials to suit all requirements and specifications. 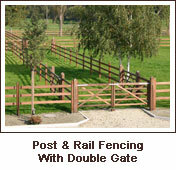 For horse owners we can supply & erect traditional post and rail (3 or 4 rail), post and electric tape or wire, post and horse fence (wire mesh). 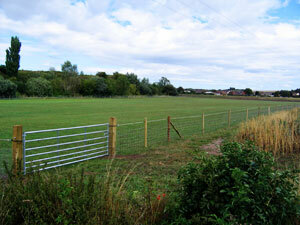 The British Horse Society recommends that horse fencing should be at least 1.25m high. The variety of wire mesh available means we can use general purpose stock fence, or more specialist non-climb horse fence wire up to 1.8 metres or 72 inches high. High tensile wire which won't stretch or go slack, or superior rigid stay and narrow non-climb mesh pattern fences are available and designed to withstand the most vigorous of equine antics. 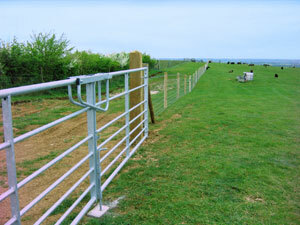 Sheep, Goats, Cattle, Alpaca and Poultry fencing are some of the most common applications. High tensile stock mesh provides a strong, multi purpose fence and a 4 x 4 square mesh will be safe and practical for Sheep or Alpacas. A strand or 2 along the top of barbed wire make it suitable for cattle. We can source materials to suit a client's specific needs and budget. Contact us to discuss your requirements. 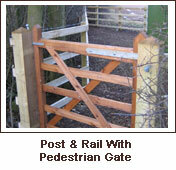 Locally-sourced hardwood fencing, 3 or 4 rail for fields, amenity areas or domestic gardens. 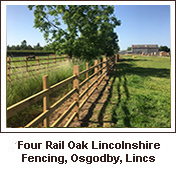 Traditional quality and aesthetically pleasing, we have erected a considerable amount of Lincolnshire fencing over the years during the course of our Landscaping work.